This interesting surname, of English origin, is a patronymic from the Old French personal name "Hu(gh)e", introduced to Britain by the Normans. This is in origin a shortened form of any of the various Germanic compound names with the first element "hug" meaning "heart", "mind" or "spirit", such as Howard, and Hubble. It can also be a topographical name for someone who lived by small hills, or man-made mounds or barrows, deriving from the plural of the Middle English "how". The surname dates back to the early 13th Century (see below). Further recordings include one William ate Howes (1327), in the Subsidy Rolls of Cambridgeshire. Variations in the idiom of the spelling include Hows, and Hoes. Elyzabeth, daughter of William Howes, was christened at St. Nicholas', Cole Abbey, London, on February 13th 1542. 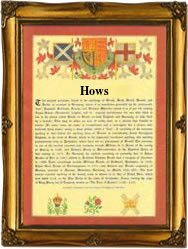 Elizabeth Howis married Mary Gilbart on August 16th 1557 at St. Matthew's, Friday Street, London. The first recorded spelling of the family name is shown to be that of Marjoria de Howes, which was dated 1211, in the "Curia Rolls of Leicestershire", during the reign of King John, known as "Lackland", 1199 - 1216. Surnames became necessary when governments introduced personal taxation. In England this was known as Poll Tax. Throughout the centuries, surnames in every country have continued to "develop" often leading to astonishing variants of the original spelling.